Gregory Downing offers 15 ways to succeed at entrepreneurship. The middle class used to follow a simple formula for building a good American life: Go to college and make good grades. Then find a job with a good company. Work hard, save money and take two weeks of vacation each year. It’s amazing how much can change in a decade or two. These days the traditional path leads to daily stress, crushing debt and uncertainty about the future. What we really need to do is make an about-face and learn how to think about work and wealth in a whole new way. The only one who can save you, and your entire family, is you. What I am referring to is entrepreneurship. I know firsthand how dramatically it can transform your life. Once a car dealership manager working grueling 80-hour weeks, I am now a millionaire many times over who takes four months of vacation a year. I made my wealth as a real estate investment business owner and motivational speaker, and regardless of the field you may choose, entrepreneurship is the only logical path to financial freedom in a global economy where all the rules have changed. A single paycheck, even two paychecks added together, is no longer enough to allow a family to live comfortably and provide for the future. If you’re lucky enough to get a good job—and that’s a big if—you might be able to scrape by, but you’ll work yourself into an early grave. And, of course, if the job goes away, the money stops. It’s no way to live—and it’s no way to teach your children to live. Anyone can make the leap to entrepreneurship, and, subsequently, financial freedom. Sure, you may have to learn new practical skills—but mostly it’s a matter of changing your mindset. Once you break free of what I call “middle-class programming,” half the battle is won. “I will always do exactly what I say I will do.” Most of us do keep our word to others, but what about the promises and pacts you make with yourself? When you don’t do what you say you are going to do, you are actually giving yourself permission to falter, to quit and to fail. “I will take action in my life—now.” Only action—not plans, not goals and not ambition—get results. Every day that you don’t take a concrete step forward is another day of the status quo, another day of accepting a mediocre, hum-drum life. Life rewards action. Every morning, ask yourself, “What action can I take today to move toward my dream of financial independence and self-reliance?” Then do it. “I will remove all unconscious, negative and scarcity-based programming.” The middle class has been “programmed” with belief systems that weren’t designed to help us attain wealth and that, indeed, barely work at all anymore. Today and every day, consciously evaluate and reconsider what works for you as you strive toward a life of wealth and abundance. First, think critically about risk and reward and determine how to effectively balance the two. Through this process of evaluation, you’ll gradually reprogram your beliefs about the fear of investing, the availability of money and the lack-mentality that is so common in our society. And as you begin to experience greater rewards, you’ll confirm the beliefs and actions that create wealth. “I will remain aware that I am 100 percent responsible, 100 percent of the time, for the results in my life.” It’s easy to blame disappointments and failures on everything other than ourselves. While it’s true that you can’t always foresee or control what happens in your life, you can choose how you respond to those circumstances. Every day, you must make time to move toward the life of your dreams, no matter how small that step is. “I will invest in a financial education program to master the skills of being an entrepreneur.” Building wealth takes work, dedication, commitment and an increased level of knowledge. This doesn’t mean getting your MBA. It does mean investing in a real-world education from others who have succeeded in doing what you want to do. “I will remain coachable.” Entrepreneurs, by nature, are go-against-the-grain types. It’s easy for them to assume they know best and disregard good advice from those who’ve been there. Don’t fall into this trap. Not only should you carefully consider advice, you should actively seek it out. Keep in mind, though, that a true mentor won’t just tell you what you want to hear—he or she will tell you what you need to hear. Leave your pride at the door and always remain open to learning new ways to approach business problems. “I will stop doing minimum wage activities.” If you don’t separate yourself from the mundane and the nitty-gritty, you might just micromanage your business away from success. It’s crucial to understand that the work of an entrepreneur is the work of the mind: thinking, planning, creating, leading and providing oversight. If you want to reach the highest level possible, leave tasks that can be accomplished by others to those with the knowledge and skills to do them. “I will always remember that time is more valuable than money.” Chances are, you grew up being taught that the way to support yourself and to get ahead in life was to trade your time for money. Linking time and earning potential is middle-class thinking. Of course, you will have to put in some long hours up-front. But eventually you’ll have systems set up that allow you to profit from time put in by others and to reinvest your earnings so that you can generate even more income. Once you have this foundation firmly in place, you’ll find you’re free of the obligation to work nine to five. “I will maintain a credit score of 760 or higher.” Your credit score is the gate standing between you and the success you dream of. That’s because lenders use credit score ratings to control the amount of money in the marketplace. As an entrepreneur, it’s crucial for you to be able to borrow money whenever you need it—regardless of what the market is doing. You should choose to have A-plus credit with a score of 760 or higher, which will allow you to borrow money any time and at lower interest rates. Overall, make it a priority to become a master at understanding, evaluating and controlling your credit score and credit availability so that you’ll never find the gate to the resources you need closed and locked. “I will no longer view debt as negative, because I will use credit to invest so I can get out of destructive debt for the rest of my life.” We’ve all heard horror stories of families so sunk in consumer debt they were forced to declare bankruptcy. And we’ve been programmed to believe the only route to financial freedom is becoming debt-free. It’s time to reprogram that belief. From this day forward, commit to using debt to invest and build your wealth. Yes, debt can be financial quicksand. But used wisely, it can also give you leverage and make you rich. “I will no longer listen to people who are not where I want to be financially.” Seek advice only from those who are where you want to be financially. You don’t want to be talked out of what you know in your gut is the path to financial freedom. “I will fulfill the unmet needs of others.” If your business doesn’t fulfill an unmet need, it’s not going to be successful — period. And in today’s highly competitive world with a business on every corner, it’s critical to identify what others aren’t doing (or aren’t willing to do) so that you can compete and win customers. To identify unmet needs, ask yourself questions like: What problems are keeping my potential customers awake at night? What do they want that they aren’t getting? What would make their lives easier? When you have some answers, work on creating a unique approach to delivering a product or service to meet the needs. “I will always be on time.” You might think rushing into an appointment a few minutes late isn’t a big deal. If so, you’re wrong. For one thing, lateness increases stress levels and might cause you to be frazzled. When you’re late, you’re being disrespectful to others, because by not managing your time well, you’re wasting theirs. When you’re not on time, you’re essentially breaking your word to yourself and the others in the meeting—a double whammy. “I will become a master at creating systems and processes.” This is all about building a business that runs effectively and efficiently so you don’t have to spend your oh-so-valuable time reinventing the wheel and micromanaging others. Becoming a master at creating duplicable systems and processes means you’ll need to understand the steps that lead to success, clearly define them, write them down and explain them to your team. But once you’ve done all this work upfront, you’ll no longer have to run your day-to-day operations. You’ll be free. “I will build the right relationships with the right power team members.” If you’re truly working toward creating wealth, you’re not going to be building one small business that you personally operate and run. Instead, you’ll be creating multiple, duplicable small businesses that are constantly creating new streams of income for you. You’ll need to be able to hand off tasks and duties to others. And that means you’ll need a strong team of the right people doing the hard work for you. Your power team is the power behind your skill as an entrepreneur. That’s why it’s critical to evaluate these people personally and make sure they’re right for the job. This is also why it’s so important to be respectful and helpful to everyone you meet. You never know when you’ll be making a connection that can benefit you next week, or next month or next year. They may become power team members and they may also refer customers your way. I acknowledge that some of these laws are deceptively simple, but simplicity gives them their power. Life is really just a series of choices. We decide whether to watch TV after work or spend an hour on our action plan, whether to take the class or not take the class, whether to hold the cards or place the bet. Most people take the path of least resistance and go with the herd. Those who don’t are the ones who will create rich, full lives that are truly worth living. Gregory S. Downing is an organizational consultant and speaker with more than 20 years of experience in management, leadership, training and business ownership. 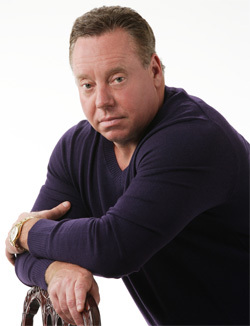 He is also the author of “Entrepreneur Unleashed: Wealth to Stand the Test of Time” (Legacy Unleashed Press, 2012).